New Design, New Office, New Stucco! We are thrilled to release our latest Tiny Timber design. We call it THE CUBE! A brief look at our model renderings and it becomes apparent why we call it the cube. Take a look below! The footprint is an 18.5 foot by 18.5 foot square and the house has a pyramid shaped hipped roof. Not only is this design architecturally quirky and pleasing, it's also about as efficient as it gets. Building in a square optimizes the amount of interior square footage by creating the most interior space with the least amount of exterior walls. In other words, This is the best value we can provide for a home this size. We hope you like the look as much as we do. You can learn a little more about The Cube under our models tab. We've also added some elevation drawings and made slight modifications and corrections to the other model designs and descriptions. For those interested in the existing designs please familiarize yourselves with the new information. We are also happy to announce that our office is finally up and running! It's a wonderful feeling to finally have an official work space. I can now say with certainty that working from home sounds like a wonderful idea, but doesn't pan out in practice... procrastination be gone! Anyone is welcome to come visit us at our office during normal business hours. We are located at 44 Quarry Road in Ithaca. I would recommend giving as a call first however in case we are out on errands. Lastly, I'd like to show everyone a new siding option that we have been working on. 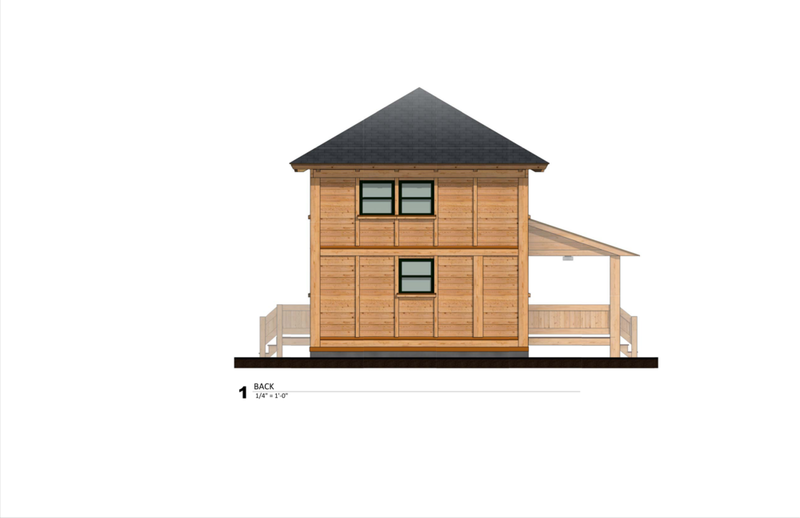 Until now, the only option that we have had to offer is the bare hemlock siding. We know that different people have different aesthetics and we want to be able to provide for everyone's needs. So we have been experimenting. We now are offering stucco plaster siding! We apply the stucco with what I can only describe as a stucco launcher and yes, it was fun! We were testing it out for the first time on this small shed project seen below. In our personal opinion it turned out wonderful. We will be offering this as an option for all future construction. As always thank you for reading and stay warm out there! P.S. I know a lot of folks have been patiently awaiting the approval of our pocket community developments. We are doing everything we can to get these developments going as soon as possible. Thank you for your patience. We will announce approval as soon as we can.